the geordie times online (newcastle united archive fanzine): HAVE YOU EVER SEEN A MA**** IN MILAN!? HAVE YOU EVER SEEN A MA**** IN MILAN!? 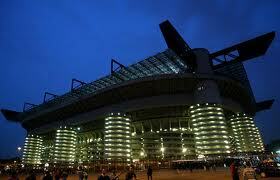 THE SAN SIRO ON AUGUST 23rd---PERHAPS? Now that we naa exactly where we stand in torms of qualification for the Europa League we can give yoo an idea az to just who we could be playin' on THORSDAY AUGUST 23rd, which iz the date that we will start wor European adventure! By finishin' fifth we gan straight into the *FOURTH qualifyin' roond which iz a 2 legged play off to get into the group stages. Other teams who have to pre qualify, include (amongst many many others!) ----Stuttgart of Jawmany---Athletic Club Bilbao of Spain---Olympique Marseille of France---Anzhi Makachkala of Russia<(wherever the hell that iz!?) ----Red Star Belgrade of Serbia---Dundee United and Hearts of Jockoland---Arsenal!? Kiev of Ukraine----(deep breath!)>Zhetysutaldykorgan! of Kazakhstan <("PLEEZE GOD!---NO!")---AND!! !----Inter MILAN of Italy!!! Now how does that aad song gan again??? "HAVE YOU EVER SEEN A MA**** IN MILAN!?" PRE SEASON FIXTURES 2012-2013****LATEST RUMOURS! "THANK GOD WE DIDN'T FINISH FOURTH!" IT'S COUCH POTATO TIME FOLKS! YI CANNIT BE IN TWO PLACES AT THE SAME TIME! ANOTHA WAALK ON THE 'TYNE-SIDE'! MANAGER OF THE YEAR!?? ?---"I BEG YOUR PARDEW!" BLACKPOOL TOWER or! THE TOWER OF LONDON? THE TOON v THE BLUE MOONIES---TODAY! THE WINO WONDERS!---WOR NEW AWAY STRIP! THE KINGS ROAD OAPs v THE TOON---TONEET!